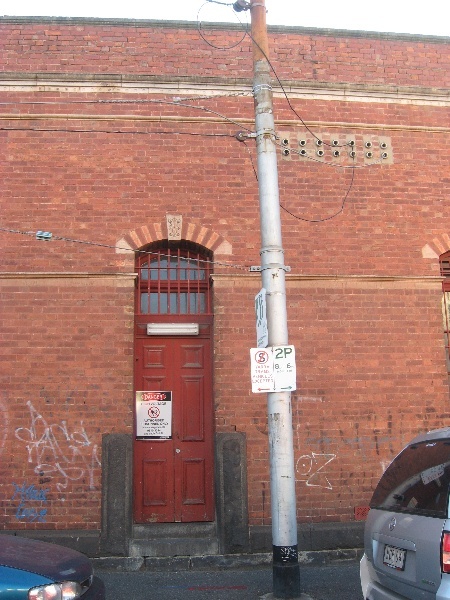 The 1887 Former Cable Tram Engine House on the corner of Brunswick Road and Black Street at Brunswick, including the Tram Substation added within it in 1936. The former Brunswick cable tram engine house was built in 1887 to service the cable tram route along Sydney Road. The engine house handled the longest cable on the cable tram system, extending from Brunswick Road to Flinders Street station and return, a distance of about 9.6 km. The steam-powered engine house was a large brick shed with a tall brick chimney attached, and had a fuel yard and stable at the rear. It was often known as the Sarah Sands engine house as it was at the rear of that well-known hotel. Melbourne's cable tram routes were progressively electrified from the 1920s, following the formation in 1919 of the Melbourne & Metropolitan Tramways Board (M&MTB). Its aim was to integrate, electrify and extend the existing cable and electric tram routes in Melbourne. In the 1920s the M&MTB built several impressive brick substations in the inner suburbs where the high voltage alternating current obtained from the State Electricity Commission (SEC) was converted to direct current at a lower voltage to power the new electric trams. By the time the Brunswick cable tram route was converted to electric traction in 1936, the Great Depression necessitated a more cautious financial approach and instead of constructing a new building, the substation equipment was installed in part of the redundant engine house. The remainder of the building was leased to private businesses. The Former Cable Tram Engine House consists of two parallel hipped roof brick structures with central gabled roof vents. It is a long single storey red brick shed-like building with the substation located since 1936 in the northern part. The facade has rendered string courses and bichrome decoration around the openings on the Black Street and Brunswick Road elevations, though the southern part of the building has been painted. There are offices in the front section along Black Street, and behind this the large open spaces typical of the interiors of such buildings have been retained. The substation remains in use, with modern equipment installed, but it retains some early machinery, including a rotary converter, a transformer and switching gear, overhead pulleys for moving heavy equipment within the building, as well as a display of assorted gauges and other small pieces of equipment. The former engine house building has the potential to contain significant nineteenth century archaeological remains relating to the cable tram system, including deep brick-lined pits and cable races that span the length of the building. Remains of an underground tank, and footings of the chimney stack and weigh bridge may remain under the more recent buildings on the west and north of the site. All of the place shown hatched on Diagram 2332 encompassing all of Lots 1 and 2 on Plan of Subdivision 346478 and all of Lot 2 on Lodged Plan 45051. The first trams operating in Melbourne were horse-drawn. The first of Melbourne's cable trams opened in 1885 on the Richmond line, and in the following six years the councils of Melbourne and the ten surrounding municipalities built a system of cable-hauled tramways. The Melbourne Tramway & Omnibus Co Act of 1883 established the Melbourne Tramways Trust (MTT), which comprised representatives of the various municipalities. The MTT built cable lines and engine houses between 1884 and 1891 and remained owner of the lines and installations until 1916. A separate company, the Melbourne Tramway & Omnibus Co Ltd (MT&OC), leased and operated the system. The first cable tram line completed was the Spencer Street to Richmond line along Flinders Street, Wellington Parade and Bridge Road to Hawthorn Bridge, which opened in November 1885. Melbourne's cable tram network became the largest integrated system of its type in the world, with about 75 km of double track on 17 routes radiating out from the centre of Melbourne to the surrounding suburbs. The steam-powered engine houses for the cable trams were generally located near the mid-point of a route, and the depots at the termini. The engine houses were typically brick buildings on bluestone footings with a tall brick chimney, 150 ft or more in height. Each contained a large engine room with a boiler house and had a fuel yard at the rear. Eleven engine houses were built in the 1880s and one in the 1920s. In 1916 the MT&OC surrendered its authority to the Tramways Board, the forerunner of the M&MTB, which took over the cable tram routes in 1920 and progressively converted them to electric traction, with the last (Northcote) not completed until 1940. The first two regular electric tram services in Melbourne opened in 1906, with the opening of a line from the cable tram terminus at Flemington Bridge to Essendon and the Victorian Railways line from St Kilda to Brighton. In the early 1900s, several municipalities formed trusts and built electric tramways in their areas. The Victorian Government in 1910 set up a Royal Commission to enquire into the 'present condition of the Railway and Tramway systems of Melbourne'. Their 1911 report recommended electrification of the suburban railway network, and also recommended that all the metropolitan tramways, cable and electric, municipal and private, be vested in a Municipal Tramways Trust, and that the cable tramways be converted to electricity. The advantages of electric tramways were considered to be lower capital costs, greater speed and flexibility, adaptability to extension and simplification of terminal shunting. In 1918 legislation was passed setting up the Melbourne & Metropolitan Tramways Board (M&MTB), which in 1919 took over authority for the cable trams, and in 1920 for the Northcote line and all the electric networks operated by municipal trusts. The M&MTB formulated a comprehensive plan for integration and development of the system as a whole, with considerable extension of the existing electric lines and gradual conversion of the cable lines. The first cable tram line to be electrified was the St Kilda line in 1925. The last cable tram line (Northcote) closed in 1940. During this time the cable trams were converted to electric traction, new depots and substations were built, lines extended and new routes added. Hundreds of new, large, electric trams were built to replace the fleets of small cars previously operated by the municipal tramway trusts. With the establishment of the M&MTB new electrical substations had to be built to supply electricity for the converted cable tram lines and for new routes, and to systematise the distribution of power from the Latrobe Valley generator of the State Electricity Commission (SEC, formed in 1920). In some cases the cable tram tunnels were reused for power cables. Electricity to power Melbourne's tram lines was taken from the state grid system at substations, where the SEC's alternating current (AC) at 6600 volts was transformed (rectified) to direct current (DC) at a lower voltage to operate the trams. Since the 1880s electric trams have been powered by direct current (DC) at a relatively low voltage - initially at 500 volts, but in later years more commonly between 600 and 700 volts. DC motors were well-suited for use on trams as they were compact and light and could easily be incorporated into the restricted space on the trams. However direct current has a major drawback: voltage drops quickly with distance, so that tram performance falls off rapidly if the tram is much more than 4 km from the power source. So substations were usually built near the middle of tram routes. The earliest rectifier systems used mechanical rotary converters with an electric motor to drive a generator. 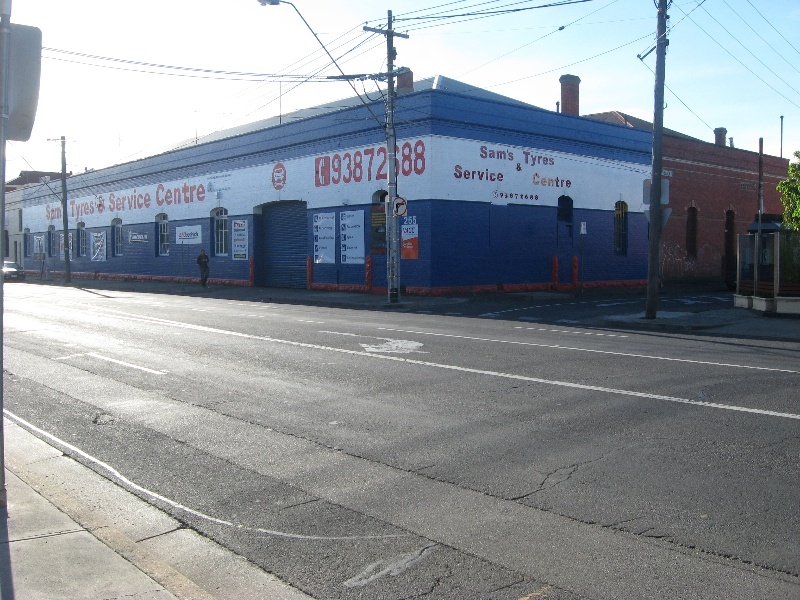 The initial installations by the tramway trusts were generally co-located within the tram depots, as at Malvern, Kew, Elsternwick, Hawthorn and Coburg depots, which all had rotary converters. In the 1930s new technology was introduced, using mercury arc converters, which employed a process involving ionising mercury vapour. These were smaller and were initially housed in glass bulbs and later in steel tanks. From the 1960s the system progressed to solid state silicon diode rectifiers. These are what is currently used, together with the extensive use of electronics, to control switching, and these systems require much less space than the old systems. The Brunswick cable tram engine house was built in this location in Brunswick Road in 1887, and the cable tram service along nearby Sydney Road opened on 1 October of that year. It followed the route of the previous omnibus service. It has been suggested (in the Heritage Victoria Heritage Inventory Site Card) that the architect for the building was Alexander Davidson, but no evidence is given for this. The engine house was built in Brunswick Road and the tram depot was in Sydney Road. It was the sixth route opened under the Melbourne Tramway & Omnibus Co Act of 1883, which established the Melbourne Tramways Trust (MTT). The Brunswick engine house was often known as the Sarah Sands engine house, being close to that famous hotel. The preferred site had been further south on the north-east corner of Park Street, but land prices there were too high. This engine house handled the longest cable on the cable tram system, being 31,620 feet (9638 metres or almost 10 km), extending from the engine house to Flinders Street station and return. The city section of the route was later handled by the cable from the North Melbourne engine house. The M&MTB was created in 1919 with the aim of electrifying and extending all of the existing cable and electric tram routes in Melbourne. Large free-standing tram substations were constructed between 1924 and 1929 in Camberwell, South Yarra, Ascot Vale, South Melbourne and Carlton. By the time the Brunswick cable tram route was converted to electric traction in 1936, the Great Depression had imbued the M&MTB with a more cautious financial approach than in the 1920s. Instead of constructing new substation buildings it was tending to adapt old buildings in order to reduce costs. 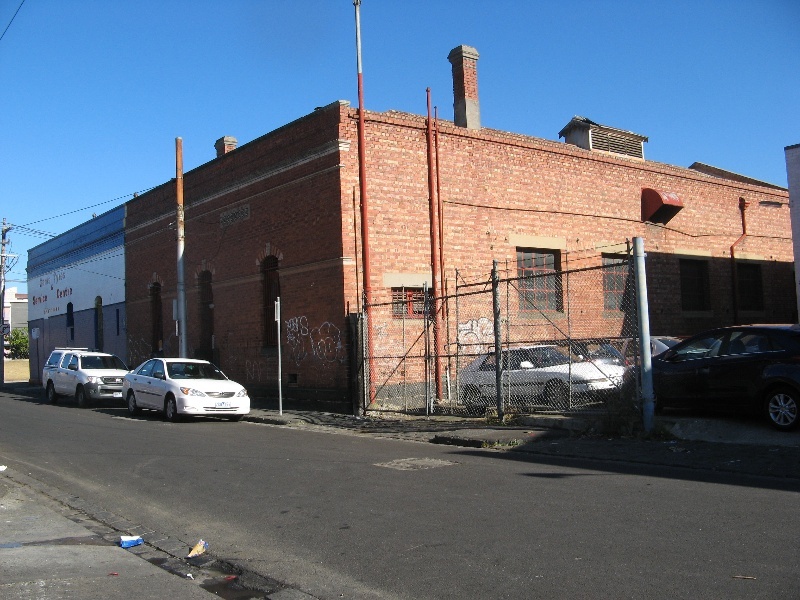 Part of the now-redundant Brunswick cable tram engine house was used to house the substation. The part of the 1887 building not required for the substation was leased out to private interests. The re-use of the engine house for the substation was made feasible by the introduction in the 1930s of mercury arc rectifiers, which were smaller and lighter than the rotary converters used previously, and meant that the large substation buildings with very deep footings which had been built in the 1920s were no longer required. 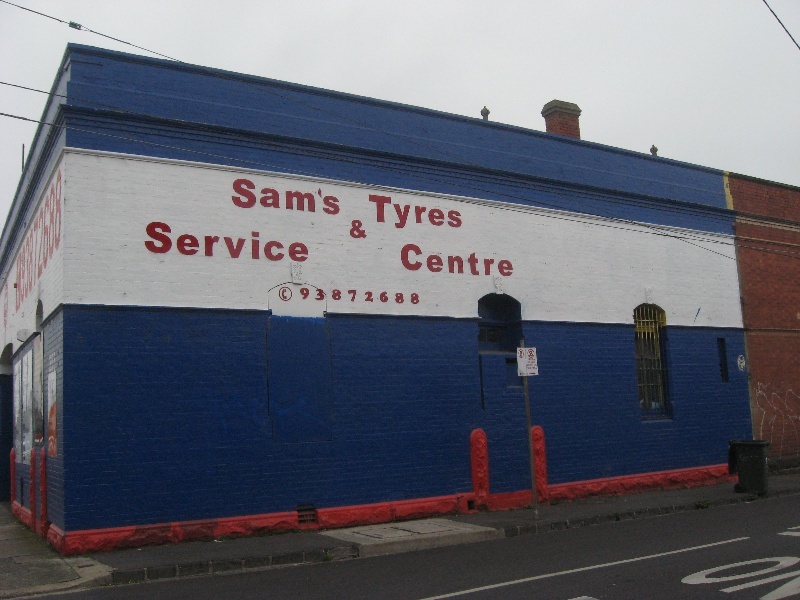 The northern part of the building is still used as a substation, while the southern part is occupied by a tyre company. The former yard at the rear has been built over, and with a small rear wing of the engine house, is occupied in 2013 by a building containing an office, shop and warehouse. 'Keeping Brunswick's Heritage', a report on the review of the Brunswick Conservation Study, Context Pty Ltd 1990. 'City of Moreland Heritage Review', Allom Lovell & Associates 1999. This was built in 1887 as an engine house to power the cable tram line along Sydney Road. When the line was converted to electric traction in 1936 part of the building became a substation, providing the trams with electric current. Interior works in the areas which were not part of the original engine house are permit exempt on condition that they do not disturb any potentially significant archaeological features or remains. 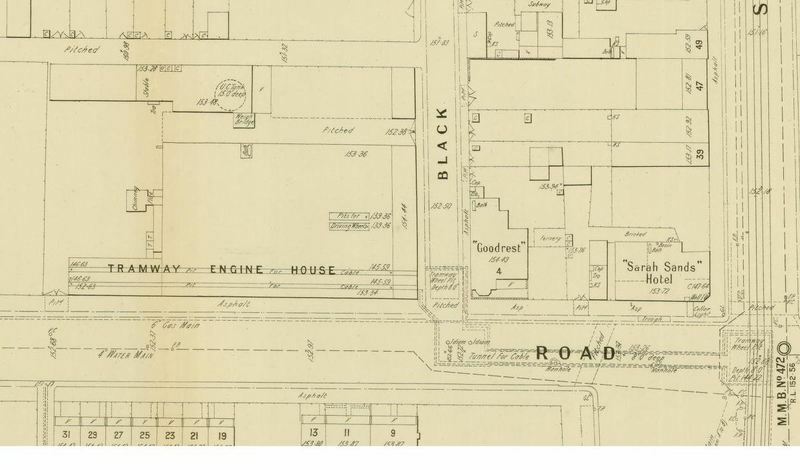 The building at 253-259 Brunswick Road and 1 Black Street has the potential to retain significant nineteenth century archaeological remains relating to its original use as a cable tram engine house, including deep brick lined pits and cable races that spanned the length of the building, as shown on the 1904 MMBW plan. 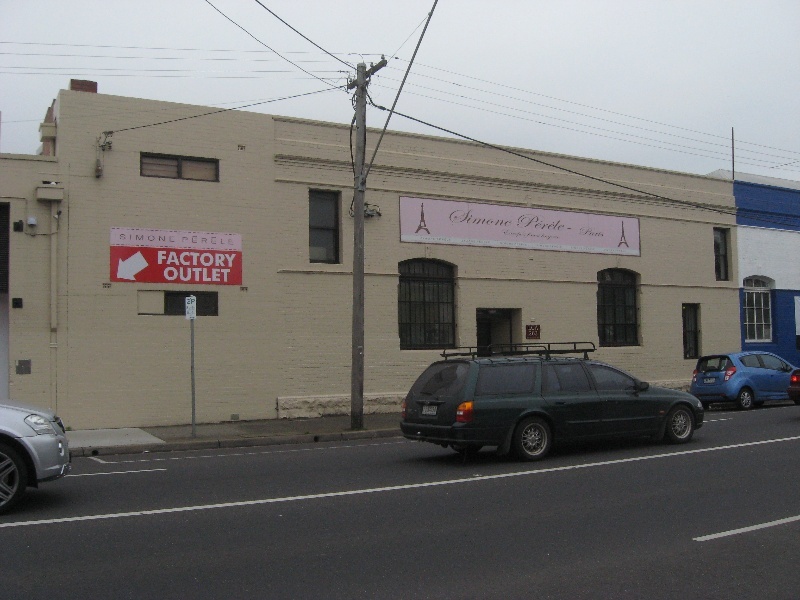 The building at 261-263 Brunswick Road contains a small section of the former cable tram engine house building, but most of it was built later. The extent of the original building is shown on the 1904 MMBW plan. The significant part of the present building at this address is limited to what is now the reception area on Brunswick Road. The shop next to it and the offices and warehouse at the rear are later additions and, while the buildings have no heritage value, they have the potential to contain archaeological remains associated with the former engine house. Interior works in these areas are permit exempt on condition that they do not disturb any potentially significant archaeological features or remains.